The market of fishfinders is dominated by units that are designed to be used in conjunction with a hull mounted sonar transducer. These units have come along way from the early days of sonar and sonar fish finders, and they pack an awesome amount of power. The downsides of these traditional sonar fish finding units is that they can only work in conjunction with a boat mounted transducer, and, for a decent performance, the price is high. The next best thing are mobile fish finders, or smartphone fish finders. These small units bring fishermen who don’t own expensive boats into the game as well. The power of these units is proportionately smaller, but for what you are getting (sonar without the need of a boat), it is an awesome package. 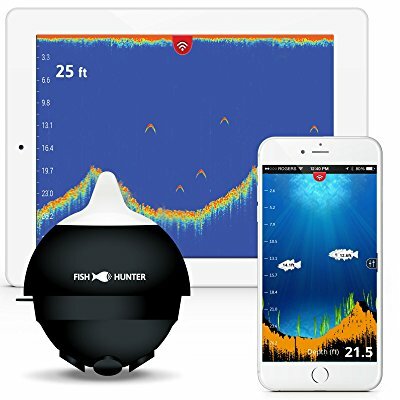 Smartphone fish finders connect to your device, either phone or tablet, via Bluetooth or WiFi, making your mobile device your monitor. This is accomplished by installing the app corresponding to your fishfinder on your device. Most are compatible with both Apple iOS and Android, giving everyone a chip in. Smartphone fishfinders are typically small, light units that could fit in the palm of your hand. They give the fisherman amazing flexibility in an incredibly small package that retains many of the features of traditional units. They give fishermen who fish from a small craft, such as a canoe or kayak, and those who fish from shore, the benefit of sonar. This opens up whole new possibilities, especially for the shore fisherman. Out of the way nooks and crannies, beneath bridges and piers, amid brush piles; all of these can now be scouted easily with sonar. One very cool feature of these units is the ability to cast them from your fishing rod using the integrated hook loop on the unit. Again, amazing possibilities open up for the shore fisherman here. Some units also are designed to be used as a flasher for ice fishing. One of the best things about this type of sonar units is that they are incredibly simple. Everything is contained in a hand size unit and a smartphone app. For the fisherman who doesn’t need a highly expensive and complicated unit, this is the way to go. Before you decide on a smartphone fishfinder to purchase, there are a couple of points you need to go over to see what is right for you. Make sure the fishfinder you are considering purchasing is compatible with the device technology that you will be using for your monitor. This includes both the base platform and its version. Many units are compatible with both iOS and Android, the two major operating systems. So, unless you are using a wildcat operation system, you are probably already covered for this part. Some units have the ability to be purposed as a flasher for use in an ice fishing hole. If you intend to use a unit for ice fishing, be sure that it is designed to withstand the colder temperatures before you purchase. The Deeper Fishfinder weighs in at about 3.5 ounces (100 g) and measures 2.6” inches (6.5 cm) in diameter. It is powered by a lithium polymer 3.7 volt battery, which will power continuous usage for 6 hours, and will fully recharge in 2 hours. The battery is compatible with a 110 V/240 V Micro USB charger. The unit is constructed from ABS (Acrylonitrile butadiene styrene) thermoplastic. The unit is compatible with iOS 8.0 and Android 4.0 and newer. The unit will operate in temperature from -4 F (-20 C) to 104 F (40 C). The unit has a sonar depth range of 140 ft (40 m), with a 164 ft (50 m) beam width at maximum depth (on wide beam). The Bluetooth connection range is 140-160 ft (40-50 m). 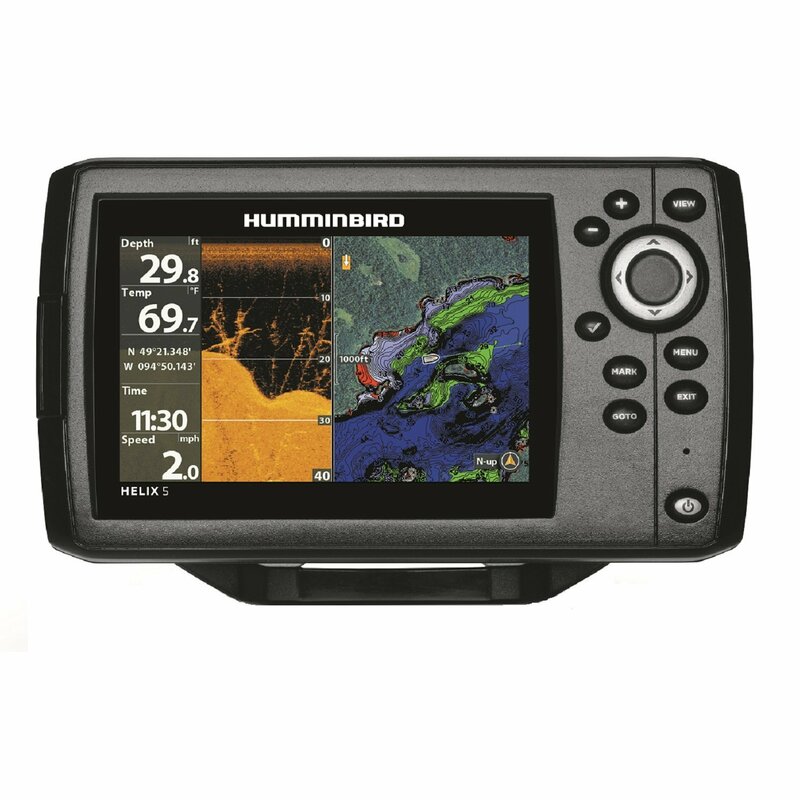 The Deeper Fishfinder operates on dual beam sonar with a 290 kHz (15o) narrow beam for accurate, high detail view of a narrow area, and 90 kHz (55o) wide beam for scanning a larger area. The unit has an integrated water temperature sensor. The unit also features Boat Mode, for use in a kayak, canoe, or boat. Boat mode will allow you to record a bathymetric map of the underwater area you are scanning, which allows you to view the topography of the bottom, so you can find the best fishing areas. For ice fishing, Deeper has a Flasher mode, for crystal clear real time display of the water column of your hole. Use split screen mode to view both the Flasher and LCD to monitor both the column and the bottom simultaneously. The Deeper also draws an image of the water column in real time, so you can get a clearer view of what’s under your hole. The Fish Hunter PRO weighs in at 5 ounces (155g). This unit has a depth range of up to 150 ft (45 m), with up to 160 ft (50 m) of width beam. The Fish Hunter PRO comes with two connection options: Bluetooth or WiFi. The WiFi will technically reach further than the Bluetooth, and will be several times faster than the Bluetooth. On the PRO’s website, the makers advertise the WiFi as better, stating that the reason is because the WiFi won’t require a cellular data connection, but Bluetooth doesn’t require any type of connection, so this is some manipulative advertising. The sonar in this unit comes from a Tri Frequency transducer, rotating between 381 kHz, 475 kHz, and 675 kHz. This essentially gets you the closest to CHIRP sonar that you will probably get in a smartphone fishfinder. The PRO’s battery has a 10 hour continuous usage time, or 500 hours on standby, before recharge. Recharges via standard USB cable. Fish Hunter PRO has a few noteworthy features: RAW and FISH view. RAW view gives you the traditional sonar feedback layout on screen. FISH view clears the clutter, giving instead a illustration of a water column, without all the reverb of RAW view. Instead, the PRO draws a fish icon with a depth reading where it detects a disturbance. The end gives you a much more simplified reading when you would rather just have a simple icon, rather than the whole sonar feedback. The Fish Hunter PRO also functions as an ice fishing flasher. The flasher uses dual beam sonar, 475 and 675 kHz to give you an enhanced detail readback. You can also use RAW view in split screen mode with the flasher. The iBobber weighs in at 1.6 ounces (55 g), making it the lightest reviewed here. The unit measures 3 inches (7.6 cm) across. The iBobber has a maximum depth of 135 ft (41 m), with a maximum 243 ft (74 m) sonar beam, at the widest angle, 42o, giving it the widest beam of the units reviewed here. The unit has a battery with an 10 hour operational life, and a 100 ft (30 m) connection range, the shortest of those reviewed here. The iBobber has a Trip Log and GPS Tag features, so you can save your favorite spots and share them with your friends via your smartphone. You can also reel your iBobber over an area while it maps the lakebed beneath (within depth range) for you to review. Another noteworthy feature is a lunar calendar in the app. This allows you to keep track of the moon’s effect on water depth and fish feeding habits. The iBobber’s only sonar view is similar to that of of the Fish Hunter PRO’s FISH view, but will display fish on screen in two sizes, depending on whether they are larger or smaller than 15 inches (38 cm). A LED beacon on the unit allows you to find it after dark. 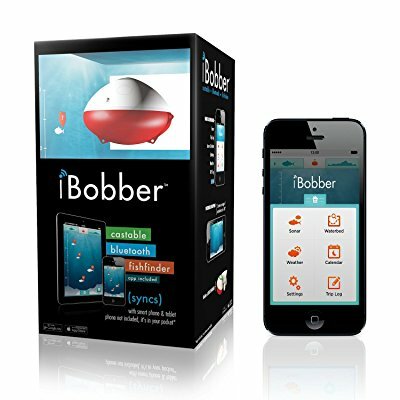 The iBobber is compatible with any device that runs iOS 6.0-9.0 or Android 4.3 and later that are compatible with Bluetooth SMART. Of the three units listed here, judging by their features, I would have to choose the Fish Hunter PRO. It’s functionality would make it my first choice. The Deeper would be my second; it’s shape is more streamlined than the PRO. Also, I would trust European craftsmanship. The Fish Hunter is made in Korea, the Deeper in Lithuania (Europe), and the iBobber in China, making it the least favorable. The most common complaint in negative feedback on these products is that they will lose connection chronically. When using Bluetooth and WiFi in a rugged environment, such as a lake, you have to expect problems to happen. The best way to get the most out of your smartphone fishfinder is to follow the manufacturer’s instructions on connection and other use issues. The most common cause of a failed connection seems to be that the unit is used with a low battery. Follow the instructions on charging your unit.